If your school or Early Childhood Centre contributes a photo of a spider (or fern) to our citizen science projects, we’ll include the photo in Te Papa’s DeCLASSIFIED! exhibition*. More on the exhibition DeCLASSIFIED! Nature’s secrets exposed at Te Papa. * provided the contributed photo has a Creative Commons licence. It is a nice way to learn more about your environment. And perhaps make spiders a bit less scary! Below is a great find made by Plimmerton kindergarten. Te Papa’s spider expert, Phil Sirvid, identified the spider in plimkindy’s photo as a black tunnelweb spider, Porrhothele antipodiana. Black tunnel web spiders are found throughout New Zealand, often under logs and rocks. They eat beetles and other insects they find on the ground. 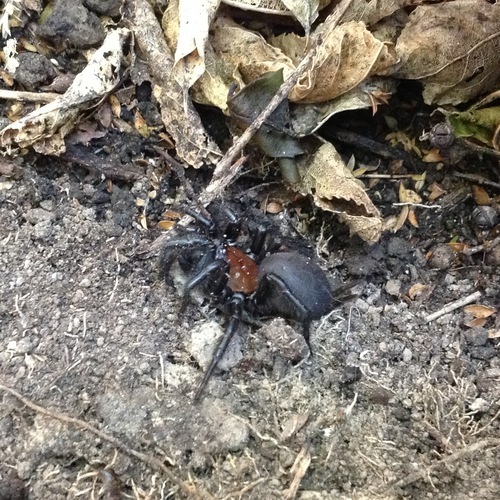 More on black tunnelweb spiders from Te Papa’s online What spider is that? Black tunnelweb spiders have been popular observations with seven reported so far. Below are a couple more great photos. 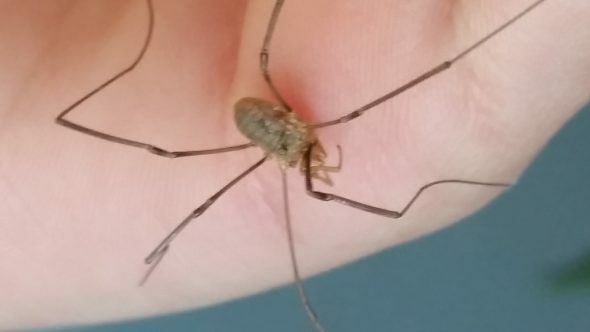 The Renwick School observation of a European harvestman in NatureWatch NZ. More instructions for participating in these citizen science projects. By uploading your photos, you can learn about the spiders and ferns around you. If your photos have a Creative Commons licence, we might feature them in the DeCLASSIFIED! exhibition as an example of citizen science in action – in fact, we’ll guarantee this for Early Childhood Centres and schools! If your school or Early Childhood Centre has contributed a photo of a spider or fern to our citizen science projects, but you haven’t heard back from us about it featuring in the DeCLASSIFIED! exhibition, please email me or leave a comment below, with the link to your NatureWatch observation. These could be good for business if they do make it to Auckland. Pest control companies will be busy! Hi, Phillip. If you’re in Auckland you probably won’t see this species, but there is a closely related species up there. Aucklanders are far more likely to find the banded tunnelweb spider (genus Hexathele). It’s broadly similar in shape but the colours are different. As the name suggests, there’s some quite prominent banding on the abdomen that we don’t see in the black tunnelweb shown in the photo above. awesome shot of the spider! Do these live in the Auckland area?